30 inch 370 CFM Chimney style range hood in stainless steel Broan Elite Chimney range hood. This model combines graceful curves and traditional European styling. This hood is engineered to meet the requirements of today's highly styled, conventional appliances and kitchens. 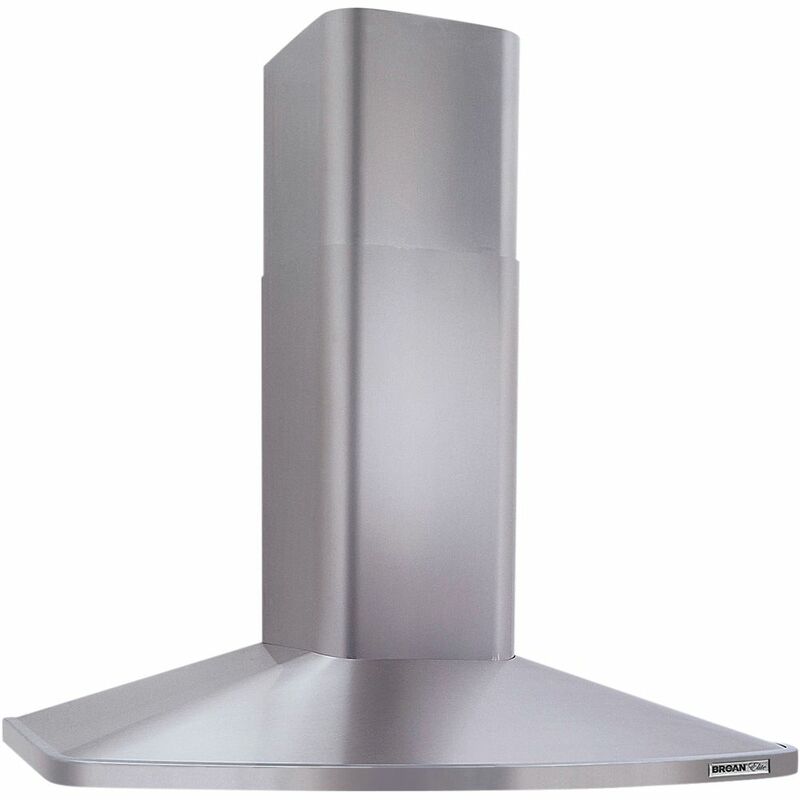 30 inch 370 CFM Chimney style range hood in stainless steel is rated 3.9 out of 5 by 24. Rated 3 out of 5 by JR from I purchased the vent hood to replace our Kenmore Elite model, which is actually made by Broan. Th... I purchased the vent hood to replace our Kenmore Elite model, which is actually made by Broan. The Kenmore model lasted about 10 years. The replacement Broan hood arrived defective. The fan would not operate. Returned it and I await its replacement to arrive. The star rating is based on my experience with the Kenmore Elite model and I suspect the new Broan Elite model will perform similarly as I saw very little difference (other than the model label) between the units. The Kenmore drew cooking vapors and odors away adequately. The operating noise level at the highest speed setting is loud. I chose to repurchase the same style/make of vent hood because it fits the kitchen space perfectly. Therefore, I'm willing to put up with the units adequate performance in favor of the styling. Rated 4 out of 5 by Willie from This particular model has somewhat unique styling with it's rounded edges. This and the fact that... This particular model has somewhat unique styling with it's rounded edges. This and the fact that Broan is an established brand with readily available filters and repair parts is why we selected it. It's been installed for one week. The supplied faux flue covers fit our nine foot ceilings with the bottom of the unit 27" above the range. We also purchased the recirculation kit. The instructions for installing the recirculation kit are included in the hood's installation manual. The packaging was a little on the light side and the unit was slightly damaged, i.e., bent. I was able to correct the issue. BTW, packaging indicates it's made in Italy - a lot of handling/movement for flimsy packaging. The telescopic faux flue seam is definitely noticable, but I don't see an alternative design for an expandable flue that extends to be flush with the ceiling. I agree with another review that the plastic sliding control switches feel cheap. The touch points for a $500-$600 hood ought to be nicer. I do not find the fan excessively loud, especially given the amount of air being moved. While I'm disappointed with the cheap feel of the controls, I would probably buy again for the unique styling, effective performance and readily available filters and parts. Rated 4 out of 5 by NinTucson from The Broan hood looks very nice in my kitchen. There are 3 fan speeds and I can see it working whe... The Broan hood looks very nice in my kitchen. There are 3 fan speeds and I can see it working when I cook. The only problem I have, is it only has on or off light switch. There's not a dim or bright, it's just bright. It took my contractor a while to put it in. He had issues with the very thin chimney extension and he was not able to cut it to size. My wall was not flush so he had to scrape the drywall to make it even. It looks nice and works well. Rated 4 out of 5 by DtownDi from Fit our specs of what we were looking for with a shorter profile from bottom to top not counting ... Fit our specs of what we were looking for with a shorter profile from bottom to top not counting the "chimney" portion. The hood is attractive & functional; the fan is louder than what we had before. Not the quietest. Also was a little underwhelmed with the plastic surround where the on / off controls are for the fan and light switches, which is frankly adequate but instead of being locked into place, had a certain amount of movement. Overall, for the price and "pro-style" appearance, and our habit of more light use vs. not much fan use, I am sure we will be pleased. We installed and uninstalled until our tile comes - thus our pic is with the protective wrapping still on and uninstalled as of yet. Rated 3 out of 5 by EofVa from A bit loud and burns up lights This unit is a bit loud and repeatedly burns out the same light bulb! Rated 2 out of 5 by KimPatt from Grossly overpriced for what you get The chimney is flimsy, not well made at all. The fan is so horribly loud that you cannot hear someone in the kitchen. Each of settings sound exactly the same! The performance of the fan does not redeem itself either -- it's unimpressive. My Viking hood was far superior in performance. The light has only 1 setting which is disappointing considering how much this hood cost. Rated 5 out of 5 by Tones from Excellent Range Hood! This is an awesome range hood. It looks great, and is very quiet. Haven't really cooked with it yet so can't speak for how well the fan works but I have to imagine it works well enough and looks even better. It is a bit tricky to install so make sure you take your time, plan ahead and do some prep work in advance. The instructions are not the best but you'll be able to figure them out. One thing to know before you start is that it says you should install a wood panel behind the drywall to allow you to screw directly into it. I didn't know about this beforehand and had already put in a tile backsplash and install the range hood on top of the tile with high quailty anchors. It worked out fine but would've liked to know that first. You also need to install on the ceiling or wall for the top of the flue to screw into to hold it up. Make sure you take your time in measuring and centering where the hood should go before drilling holes. All in all, it takes some time and thought to install but it looks really good.